Save Time & Effort - Have Certified Wi-Fi & Cell Phone Signal Booster Installers Install For You. A nationwide installation team consisting of certified, licensed, bonded, and insured wi-fi and cell phone signal booster installers and integrators is ready to get your system installed professionally, per contract terms. 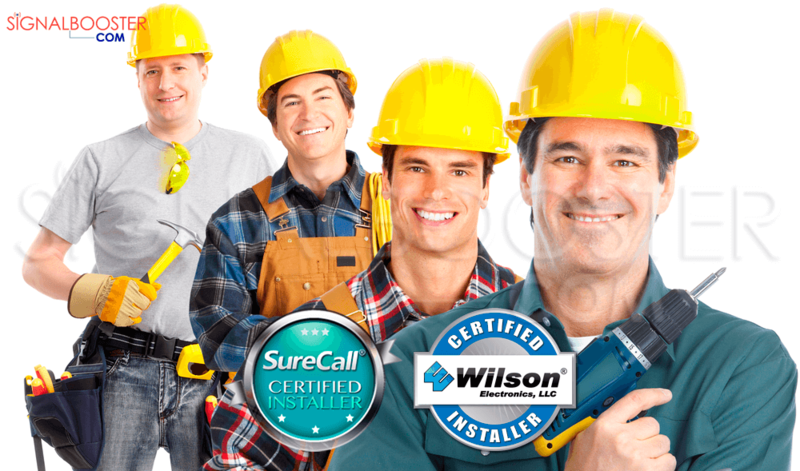 Our expert installers and integrators are certified by many manufacturer certifications including SureCall, Wilson Electronics (Wilson Pro), Cel-Fi, HiBoost and others. They have experience required in designing and integrating boosting systems that boost reception to practically infinite amount of Wi-Fi & Cellular-blocked spaces. Thanks to their vast experience, their expertise is unmatched in the signal boosting industry. As your cell phone booster contractor, we will first perform a site survey at your location within USA and Canada. A professional wi-fi and/or cell phone signal booster system design will be provided with quote for a fully integrated and installed cell phone signal booster equipment. No ongoing maintenance costs required unless you require Small Cell Enterprise System, Active DAS, or Public Safety DAS (Active) which include maintenance service that provides annual re-inspections & re-certifications to meet fire code requirements per respective city's fire marshall's office. Upon contracting our services by acceptance and approval of quote, we will go to the site location and integrate/ install it within shortest time-frame possible. Thereafter, enjoy the benefits of strong cellular reception within your building or facility with zero ongoing monthly costs to maintain the cellular amplifier installation completed. Or submit request for quote to get started immediately.